I’m back! So many pictures to dig through – I love it. 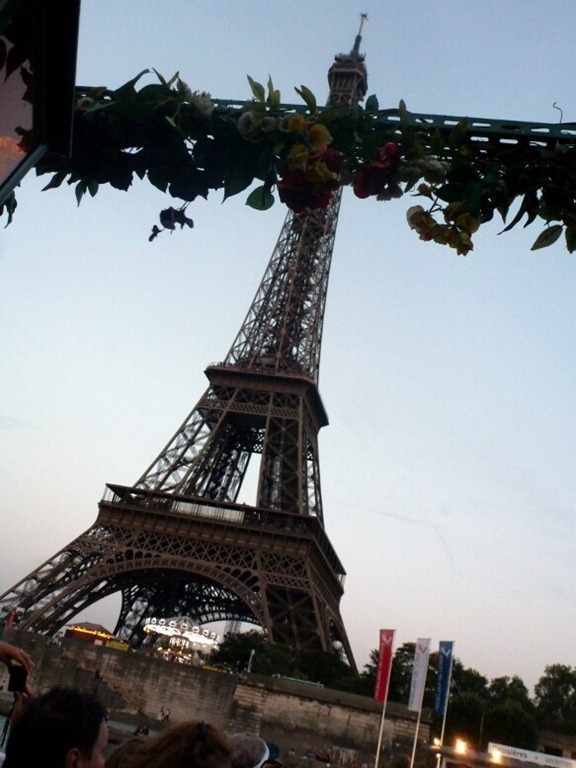 Today I have a recap of our second day in Paris. 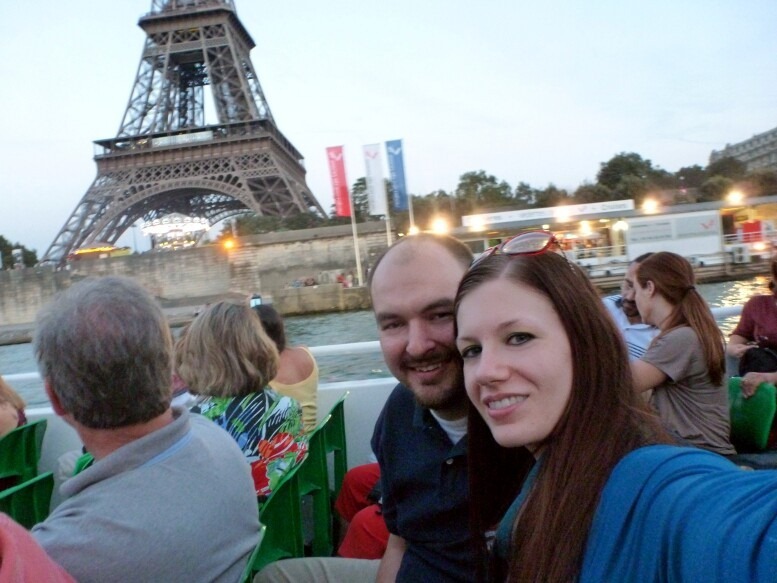 We have been back home for a few days and I am now recapping some of the highlights of our trip to France and Italy. Missed Day 1? You can read it here. 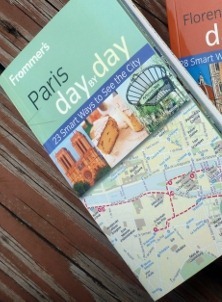 My primary planning resource for our time in Paris was the Frommer’s Paris Day by Day guidebook. 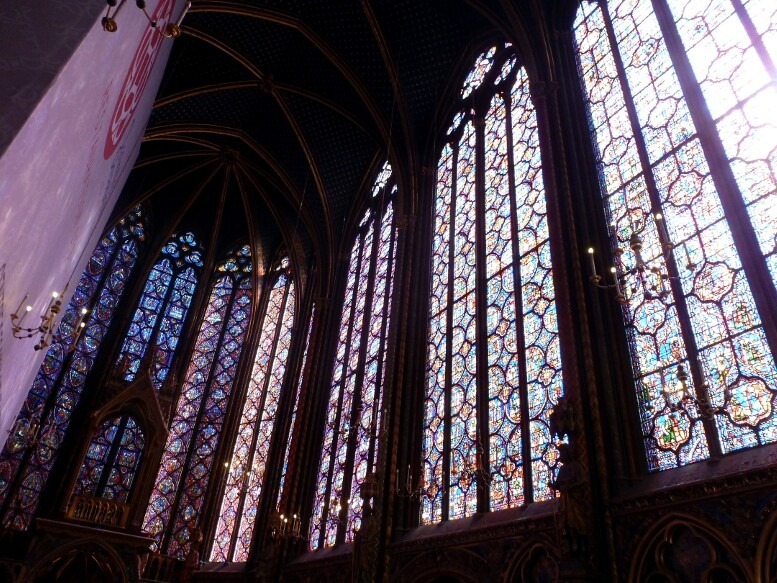 We followed the Paris in 3 Days itineraries, which featured planned sightseeing routes with color photos, detailed maps, transportation options between sites, prices, restaurant recommendations and lots more. I carried this compact book everywhere and loved it; I cannot recommend it enough. 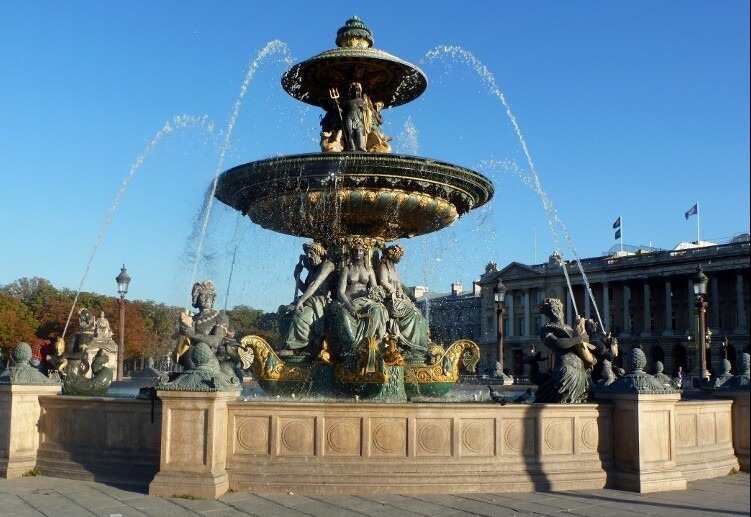 Following the Paris ‘Best in 1 Day’ itinerary for our first full day, we started our morning at the Place de la Concorde, the city’s largest public square. 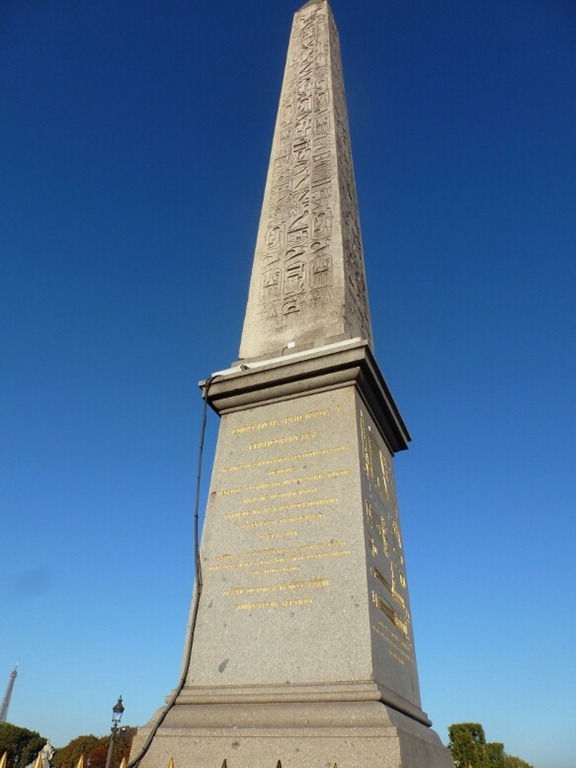 A 3300 year old Luxor Obelisk, which was a gift from Egypt resides in the square, near the location that many French revolutionary victims’ lives ended on the guillotine, such as Marie Antoinette. From the square we also had views of the Eiffel Tower, down the Champ Elysees, and the Arc de Triomphe. We then walked through the Tuileries gardens, adjacent to the Place de la Concorde, and headed over to the Musée d’Orsay, on the left bank of the Seine. On our walk over, we crossed this bridge, the Pont des Arts, decorated with love locks. 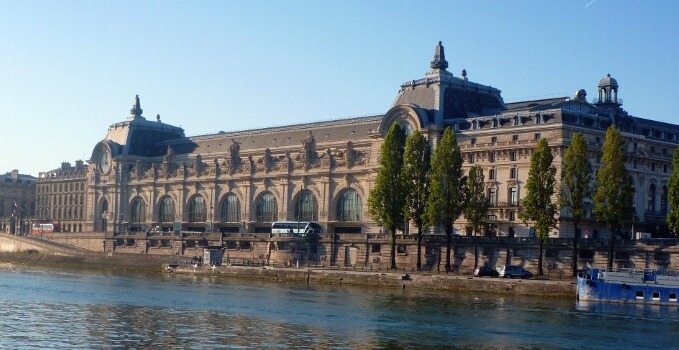 This art museum, the Musée d’Orsay, houses a large collection of impressionist and post-impressionist art, including pieces by Renoir, Manet, Monet, van Gogh and more. My favorite part of the museum was the bright central hall, filled with beautiful sculptures. 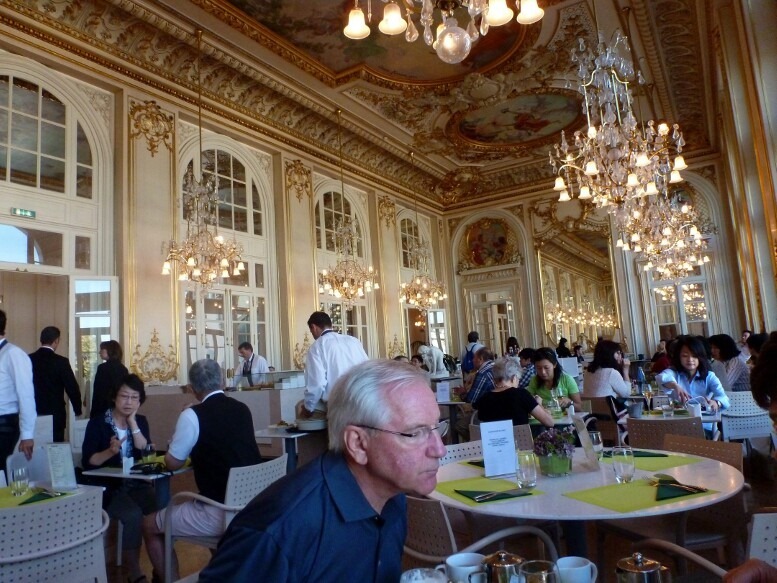 Following my cousin’s wife’s recommendation, we had lunch at the restaurant in the d’Orsay. What a beautiful setting! The food was very good too. 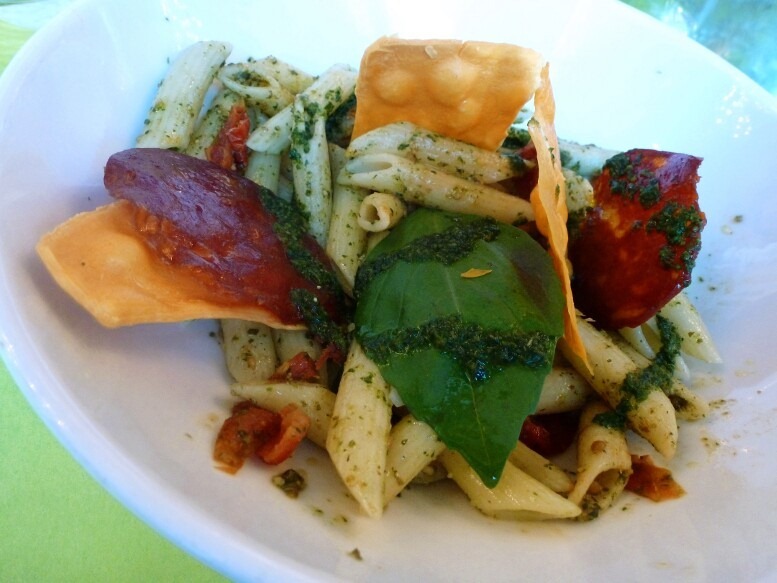 I ordered a penne pasta dish with pesto, crispy cheese, and chorizo. 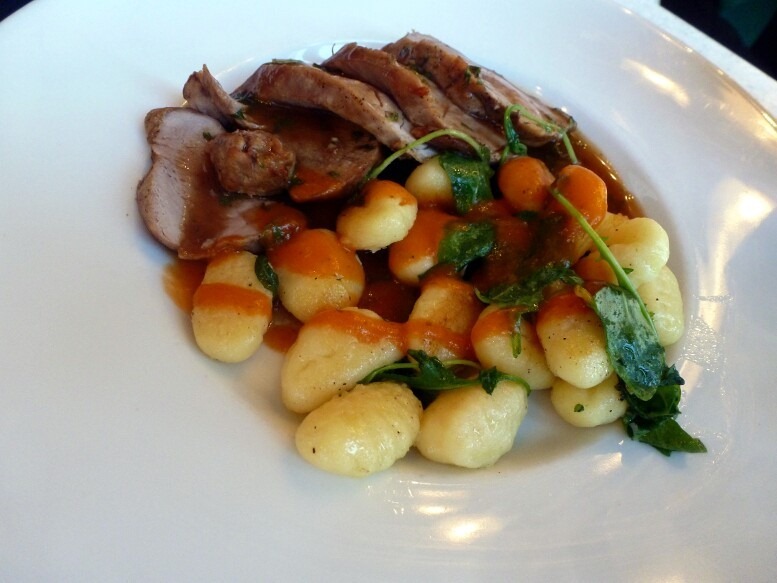 The huz had the pork filet with gnocchi. Despite how yummy my dish was, I had a bit of his and had mild food envy – and I’m usually not even a pork fan! Very good. Dessert for lunch just seemed like the right thing to do. You’ve got to listen to your body. 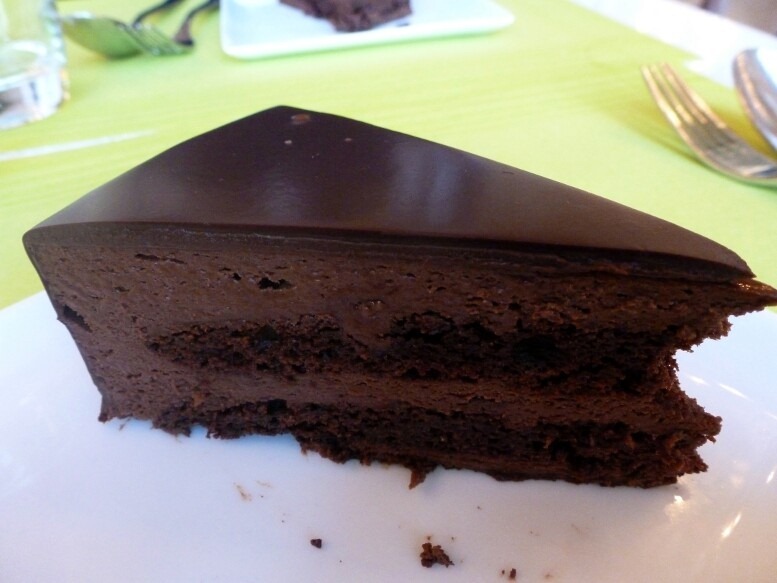 A slice of chocolate cake for each of us! Loved the ganache. 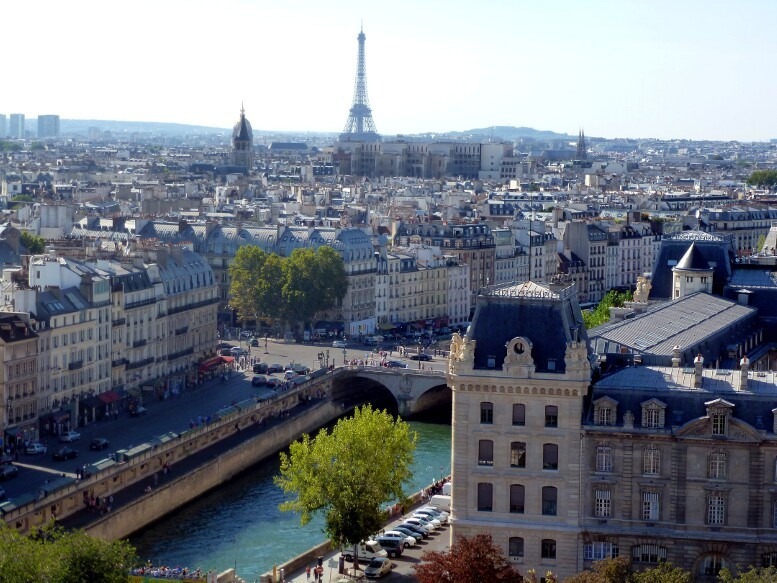 After leaving the d’Orsay, we enjoyed a lovely stroll along the Seine until we reached the Ile de la Cité, a small island in the middle of the Seine. 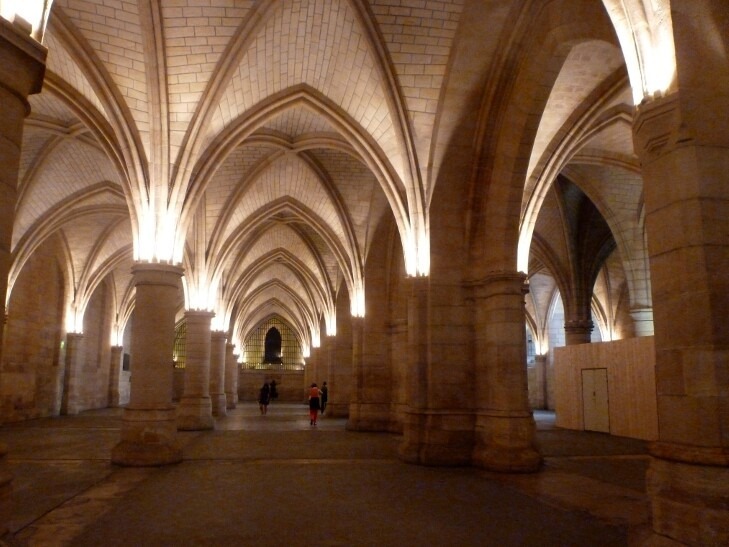 On the island we first visited La Conciergerie. I absolutely love façade of this structure, featuring what my Frommer’s guide accurately describes as “fairy-tale towers that soar about the north end of the island.” It’s also appears rather intimidating, don’t you think? 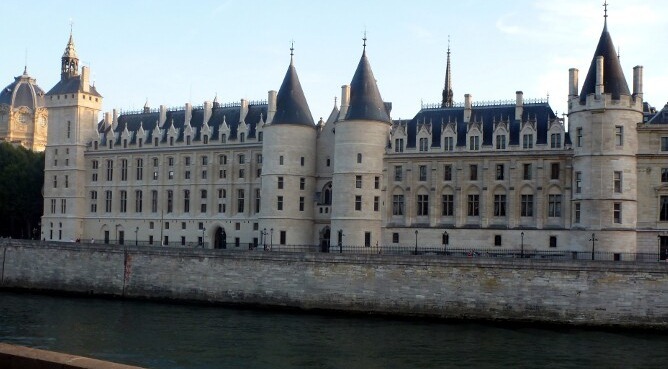 La Conciergerie was a royal palace in the 12th and 13th centuries, and then became a prison during the French Revolution. 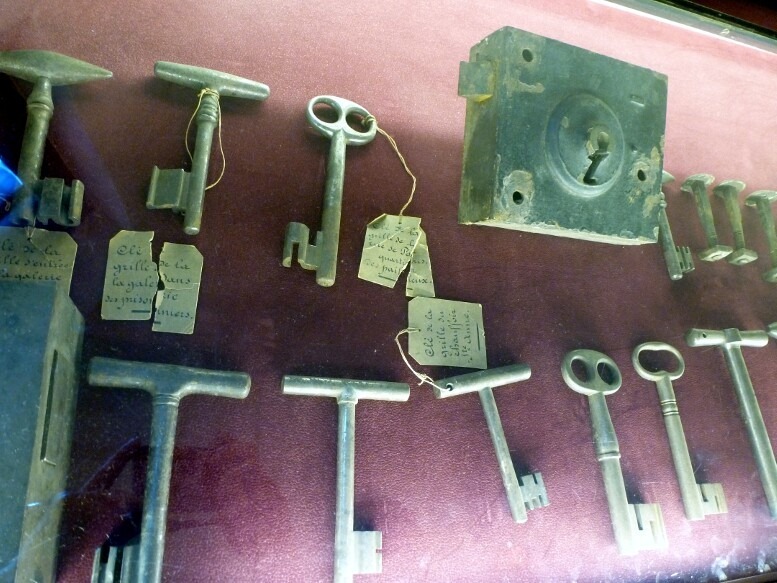 Skeleton keys for the prison cells. 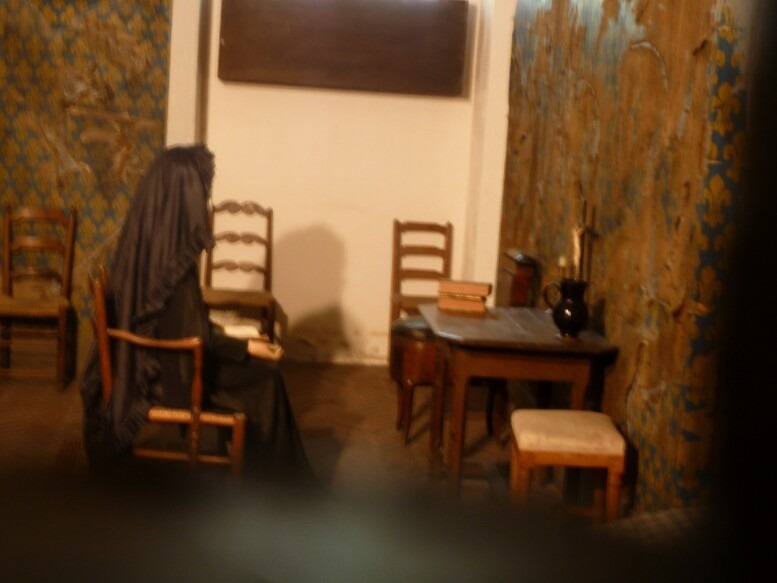 La Conciergerie featured a recreation of the prison cell in which Marie Antoinette was held. 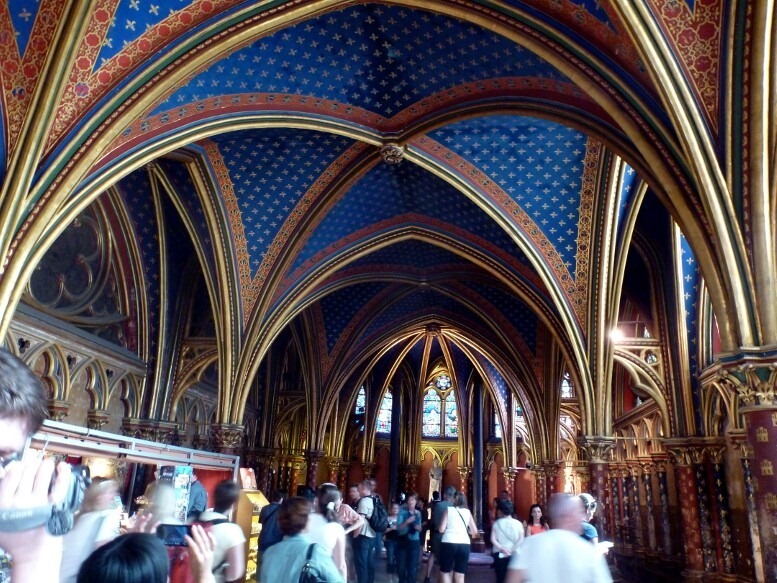 Next door to La Conciergerie is the breath-taking La Sainte-Chapelle, which we also visited. 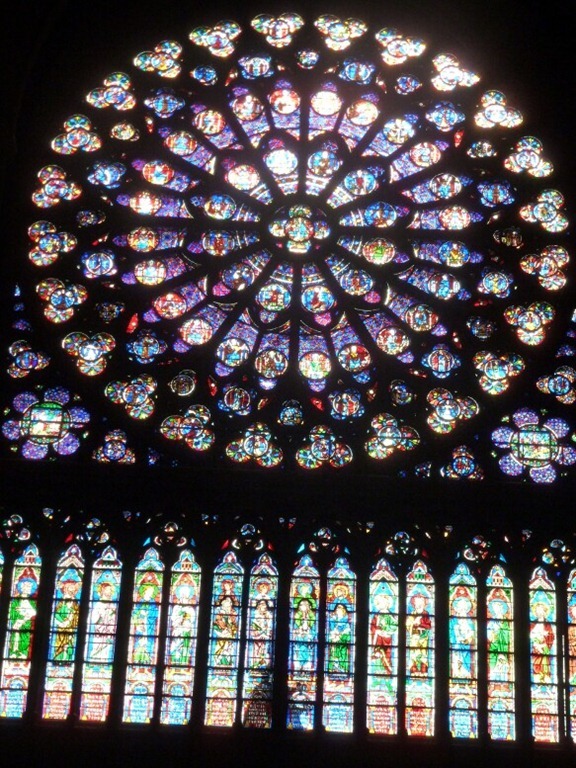 This was absolutely one of my very favorite things we visited in Paris by and far one of the most beautiful things I have ever seen in my life. 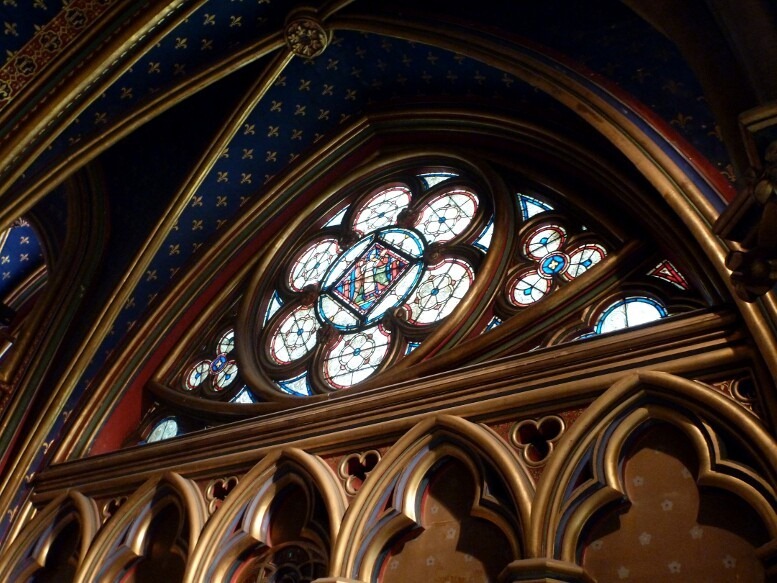 Construction on the chapel, featuring dramatic gothic architecture, began in the 1200s. 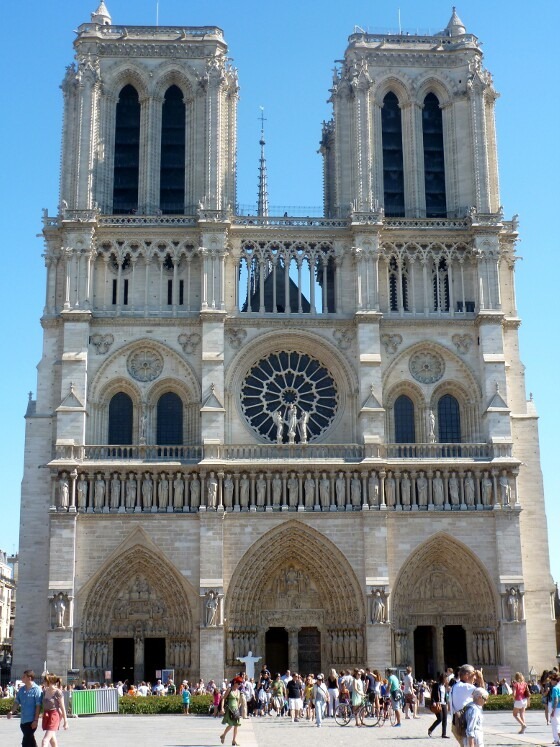 A bit further down the island resides the famous Notre Dame Cathedral. 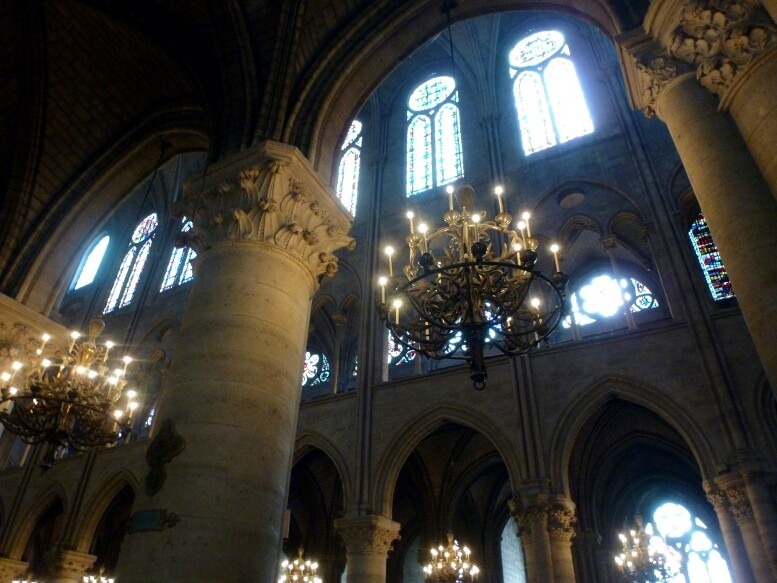 Inside the Notre Dame Cathedral. 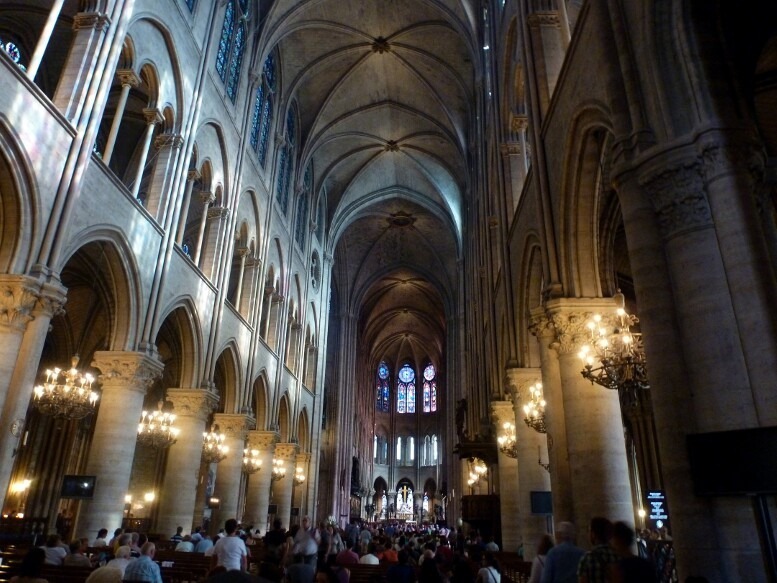 It was so very grand inside. 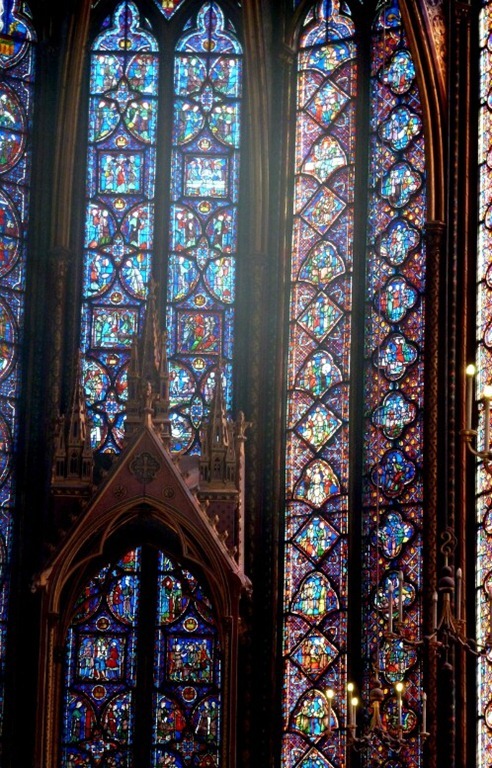 Stained glass in the cathedral. 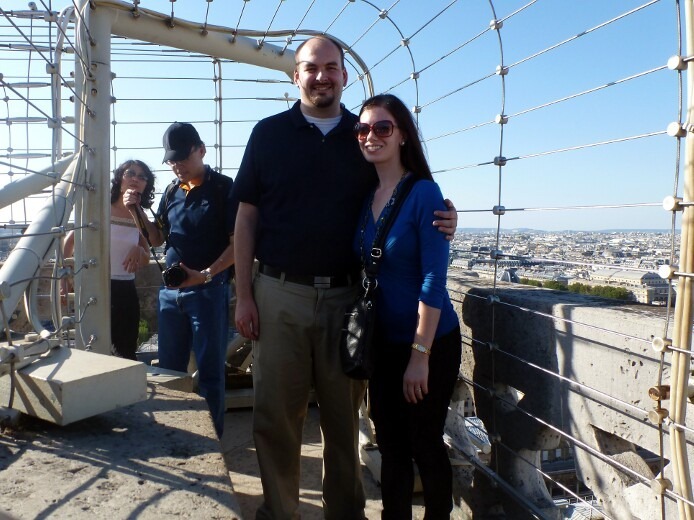 Then we waited in line to walk up LOTS and LOTS of stairs (220 feet to be exact!) 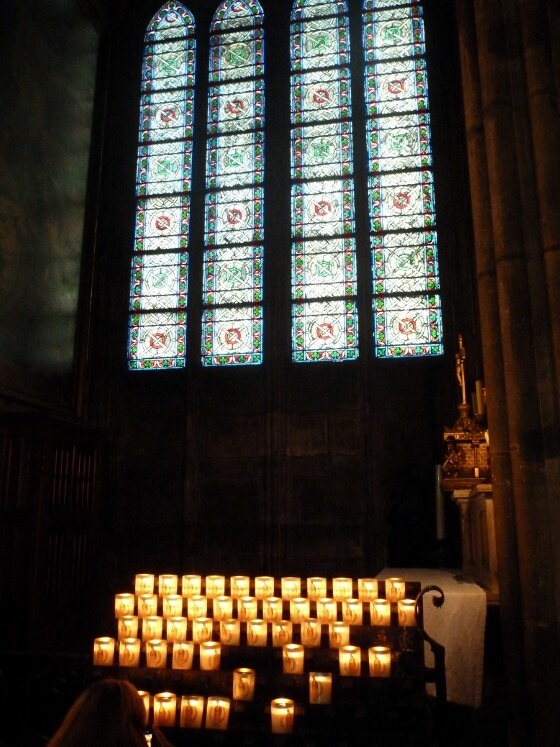 to the towers of the cathedral. It was quite the hike, but we made it! The views of Paris were most definitely worth the hike. 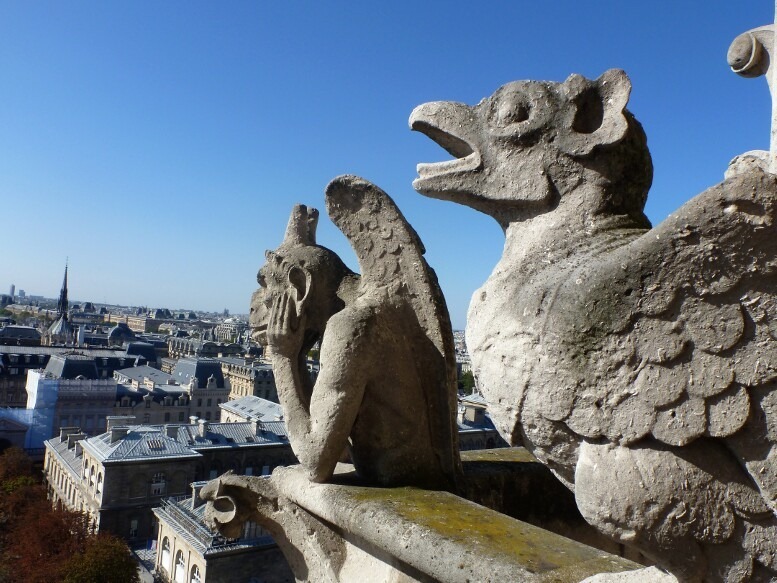 From the towers we could also get an up-close look at the gargoyles. They were so cool – I love them! This guy below is nomming on something. Pretty intense. 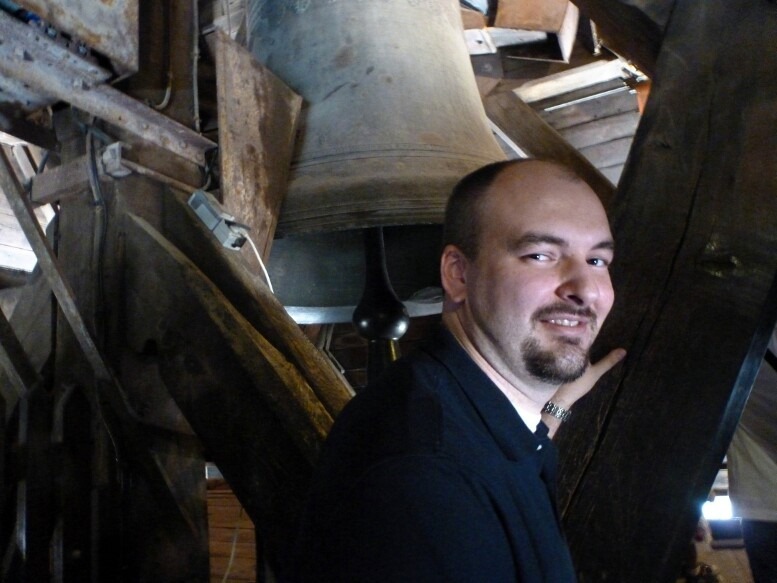 Here is the huz pretending to the the hunchback of Notre Dame in the Bell Tower. See the bell!? 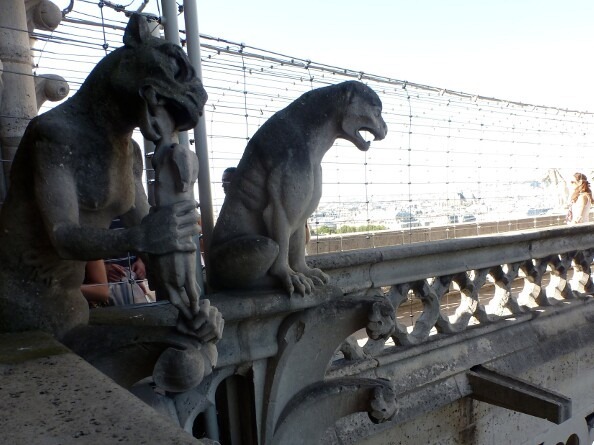 I wanted my picture by the gargoyle who was nomming on grapes. 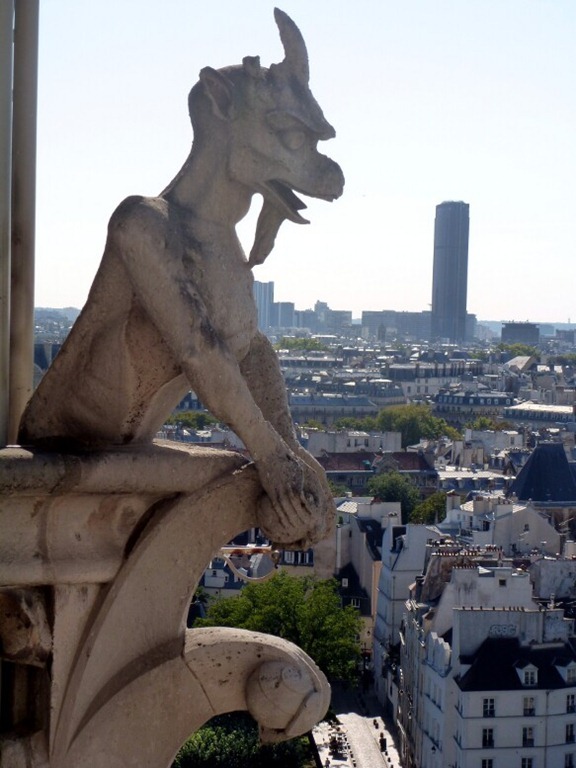 GargoyleGoesNomNom. 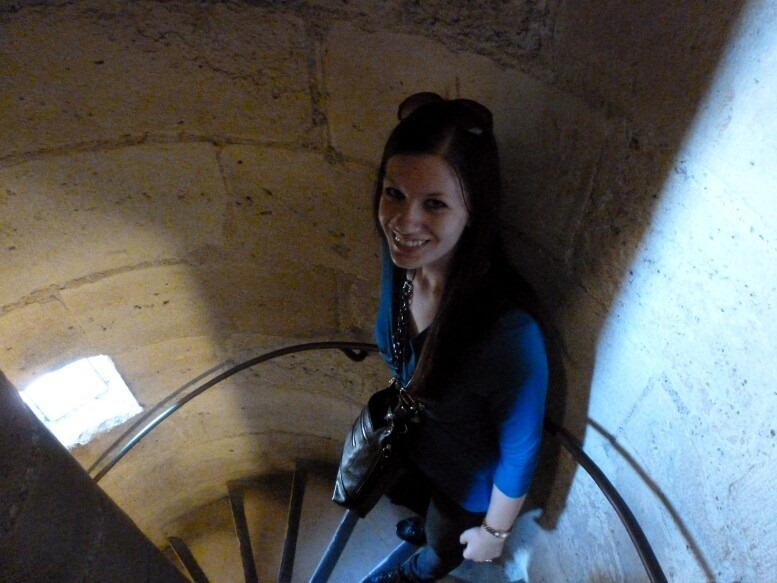 Then back down, down, down the windy spiral stairs again! 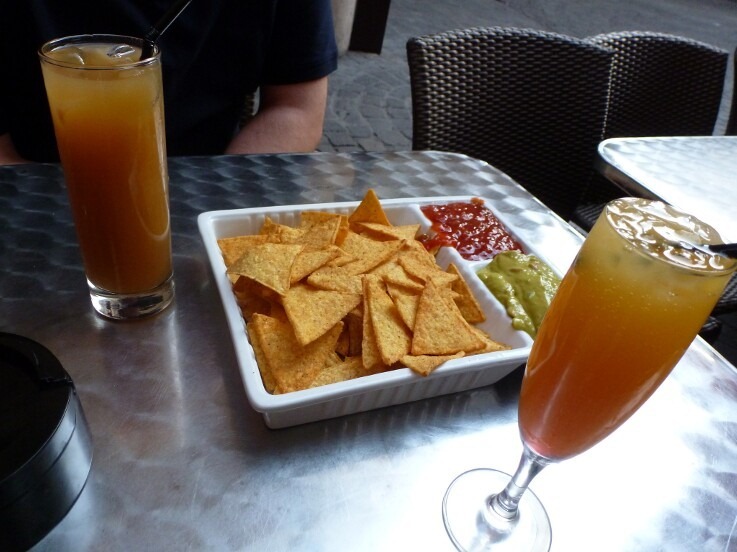 After a rest in our room, we stopped by a restaurant in a quaint little alley in a touristy area near our hotel for a drink and a few nibbles. I think this is the only cocktail I had on our whole trip! I had wine pretty much every day (except I remember having beer once in Italy). 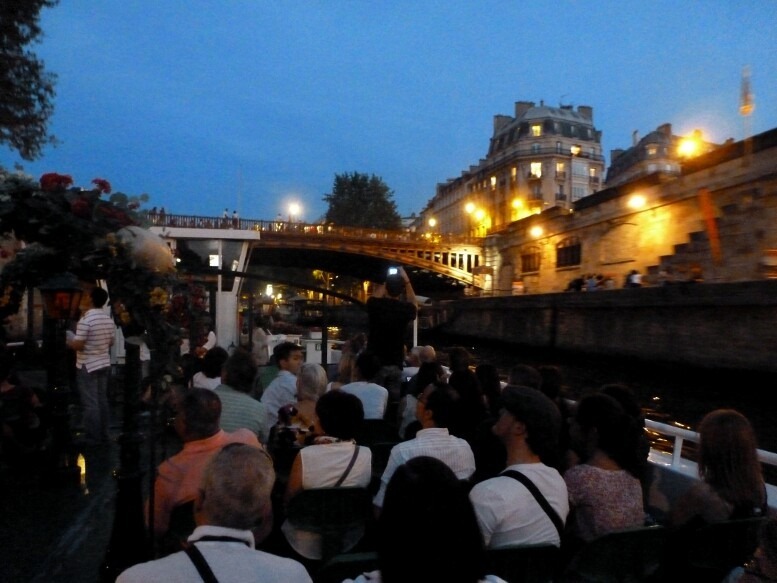 After drinks, we went on an evening river cruise down the Seine – where we each had another drink on the boat! 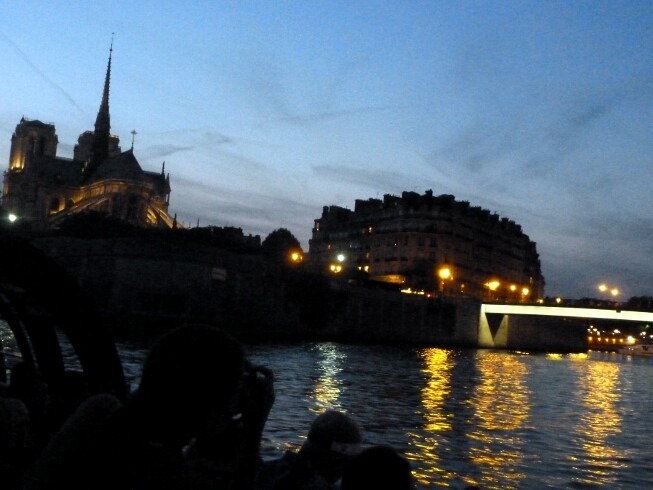 Just sailing by the Eiffel Tower. No big deal. 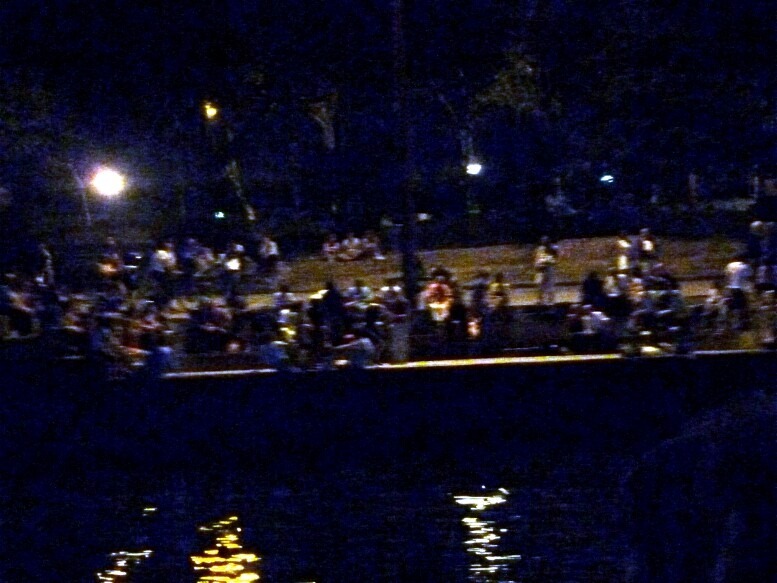 Sitting on the banks of the Seine with a bottle of wine in the evening is a sport in Paris. I would probably win at this sport. I am just saying. 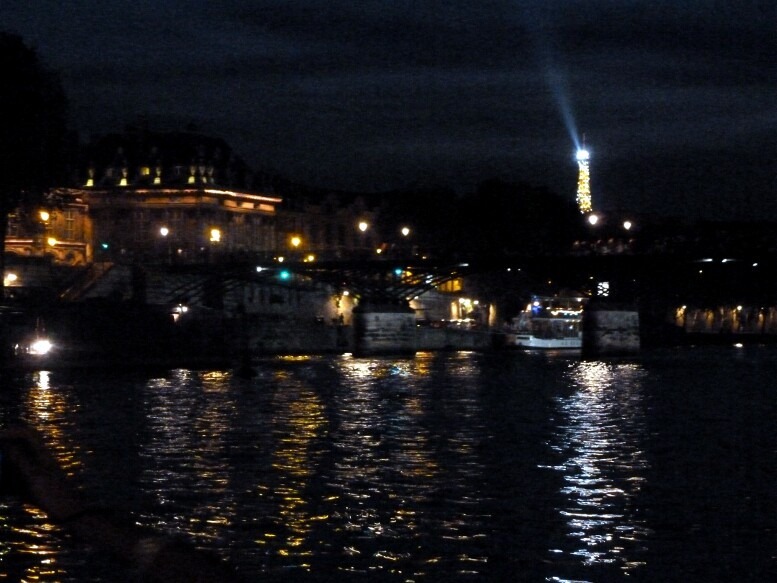 From the river we again saw the Eiffel Tower lights show from our boat. My heart was pounding – how incredible! Such an incredible day! I am so lucky. 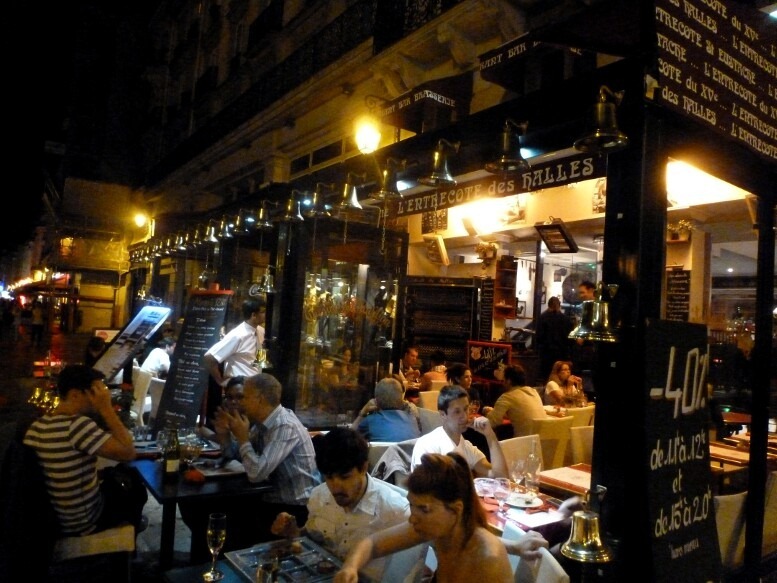 After our river cruise, we headed back to our hotel area for dinner at L’Entrecote des Halles. Dinner was alright, but nothing to write home about. 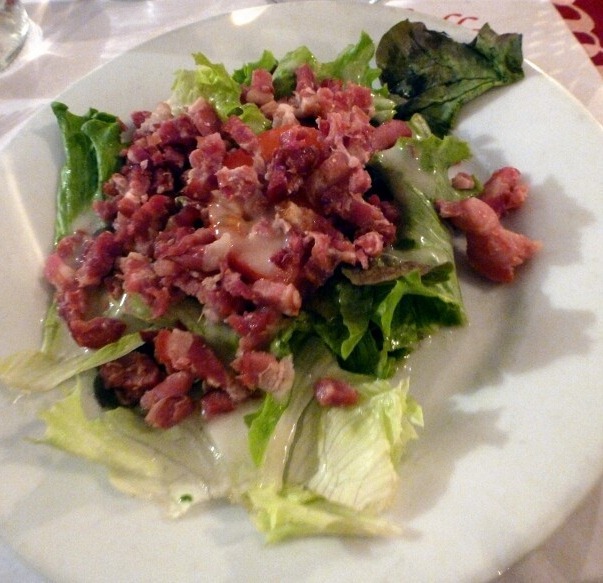 Salad with bacon lardons to start, for me, while the huz had French Onion Soup. 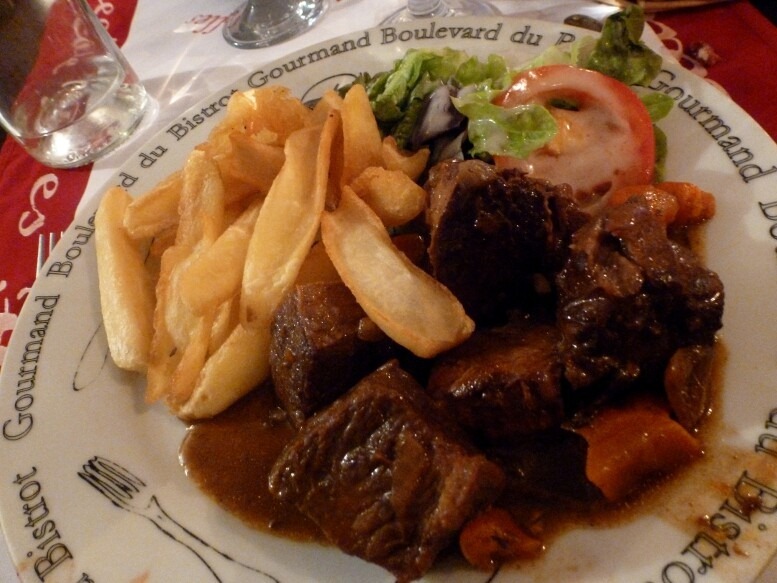 I ordered the Beef Burgundy. It was okay. (But let’s be honest, mine is better.) I had some red wine with dinner too. 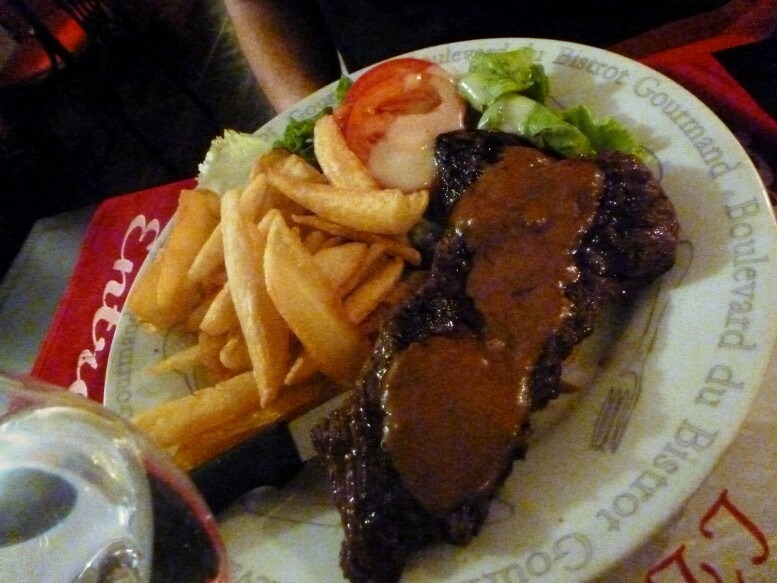 The huz had some sort of beef steak. After dinner we headed back to the hotel to rest up for another big day. More soon! 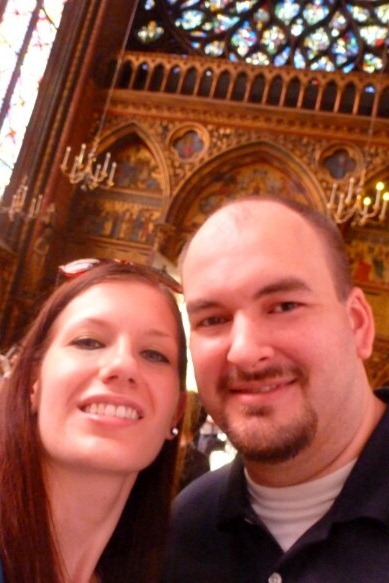 What’s it like being married to Quasimodo? 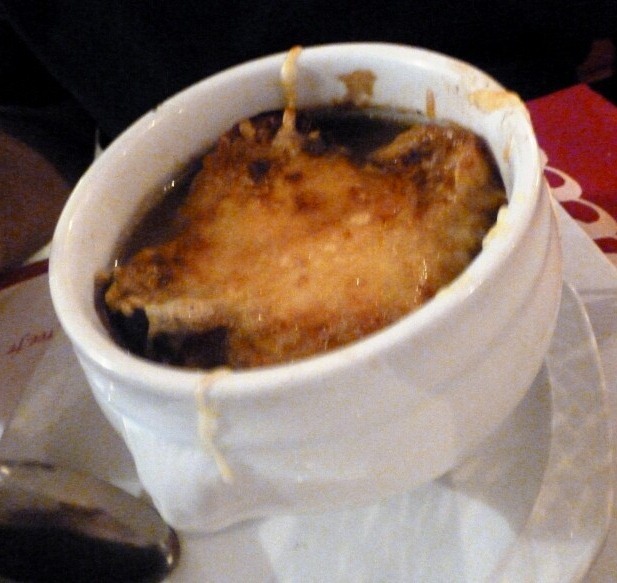 Pingback: Europe 2012: Paris-Day 3 « Meg.Goes.Nom.Nom. Trip looked fabulous! Have you recovered yet? It took me a solid week to get over the jet lag! 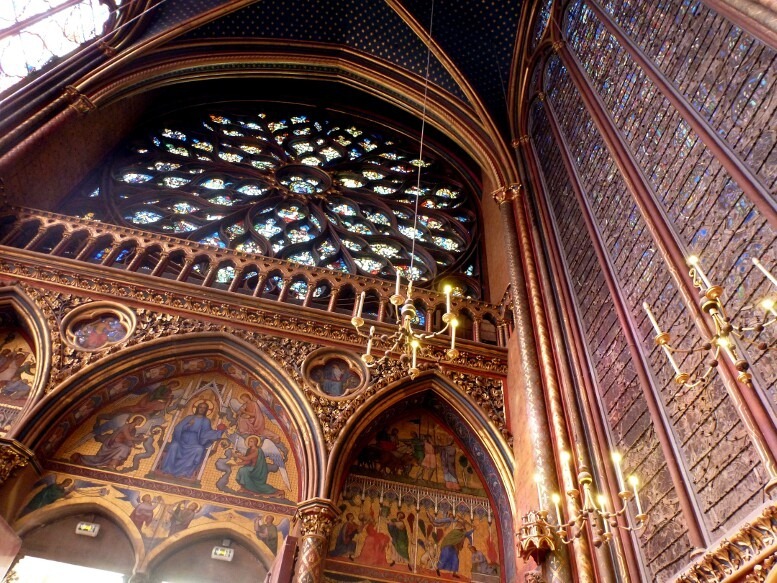 Pingback: Europe 2012: Day 5–Traveling from Paris to Florence « Meg.Goes.Nom.Nom. 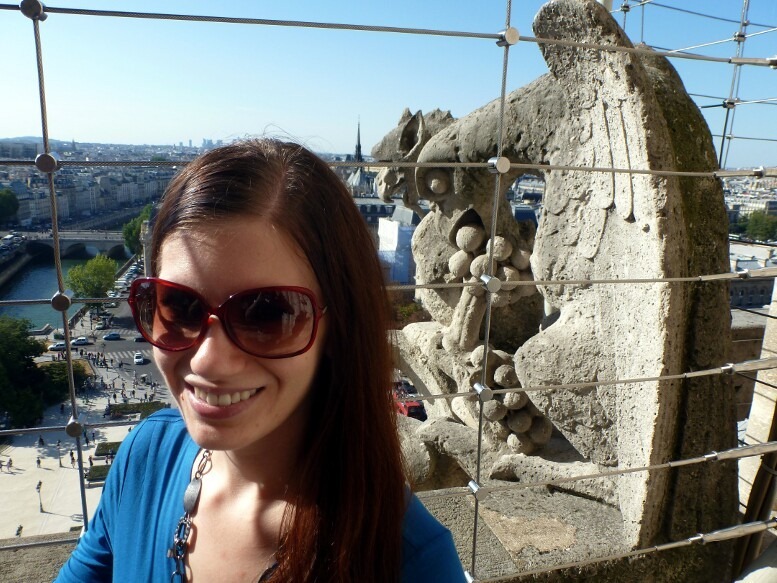 Pingback: Europe 2012: Day 6–First Full Day in Florence « Meg.Goes.Nom.Nom. 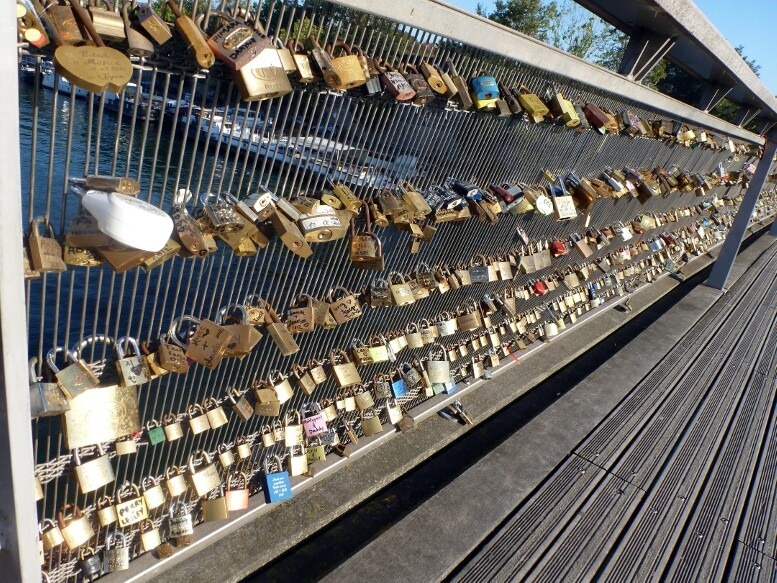 Pingback: Photo of the Week-Pont des Arts’ Love Locks | Meg.Goes.Nom.Nom.